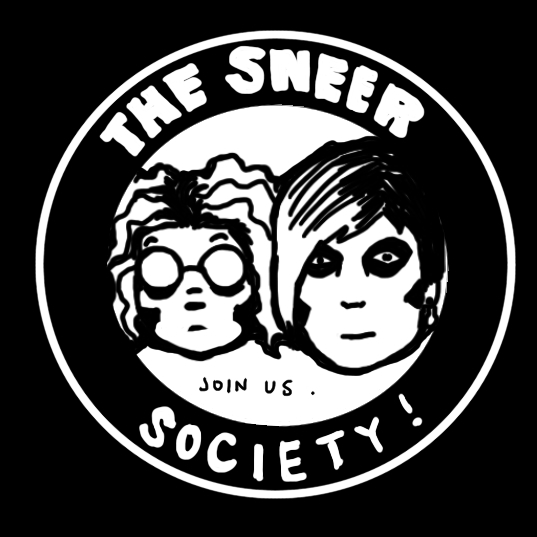 Here is your chance to join the Official Sneer Campaign Fan Club: Sneer Society. Taking cues mostly from the offers in the backs of old comic books, we have assembled a package of fabulous treats for any of our beloved readers who are willing to shell out $20 USD to prove their loyalty. We’ll mail you an official Sneer Society membership certificate with your very own name or nickname! Or whatever! Hey, it’s your certificate. This is a beautiful 11 by 8.5 inch certificate designed by us, Sneer Campaign, and signed by us. Frame it, display it, brag about it, and tell everyone you’re a certified member of the Sneer Society. You can even show it to future employers to prove you are worth more. When I joined the Demento Society, my favorite part (oh, besides the Big Ten Inch ruler which I still use) was my tiny card saying I belonged there. I was demented. This card with your name and member number will be credit card sized so you can carry it around in your wallet. It will even be laminated, for your pleasure. Make sure to always have it on you, because this will get you into the future SneerLand or a ride to Sneer Planet, for free! You guys, I got a button maker just for this! These .5 inch buttons will feature original Sneer Society art. You’ll get two of them! One will be our logo above, because you know you want that. One will be a full-color Sneer Campaign button. These buttons are exclusive to Sneer Society members, because we ain’t gonna deal with selling buttons. Wear them on your clothes! Put them on your pet’s clothes! Be careful, the back is sharp. Although I do love my decade-old signed photo of Dr. Demento, we know you do not want a photograph of us. Enjoy a brand new overindulgent self-portrait exclusive to Sneer Society members, signed by your heroes, Amandoll and Dollissa. One of the signatures may or may not be forged. Display this 8.5 by 11 inch glossy print on your front door, so people know your belief system before entering your home. All you need is $20.00 and a little moxie! To learn exactly how to join, email sneercampaign@gmail.com. We will ask what name or names you want on your membership certificate and card, for your snail mail address, and whether you want your signed illustration to be full color or black and white. We’ll also let you know how you can pay us the meager $20 USD (no shipping charge)! But here’s a hint: we take PayPal. It may take up to 3 weeks to get your Sneer Society package, especially if you live very far from us. It will probably not take that long though.